You may wish to read an introduction to this section or pages on Roman or Early Christian Aquileia first. The fire set to Aquileia by Attila in 452 marked the end of the city as a trading centre and caused a major decrease in its population. It did not impact however on the importance of its Archbishops who were at the head of a group of dioceses. In 554 the Archbishops of Milan and Aquileia did not agree with the outcome of the Second Council of Constantinople and in 557 the Archbishop of Aquileia declared he did not recognize any superior authority in religious matters. In 568 when the Longobards invaded Italy the Archbishop moved his residence to Grado, a small port on an islet south of Aquileia, which was still controlled by the Byzantines. The Archbishop assumed the title of Patriarch to indicate he regarded himself as having the same authority as the Patriarchs of Rome and Constantinople. 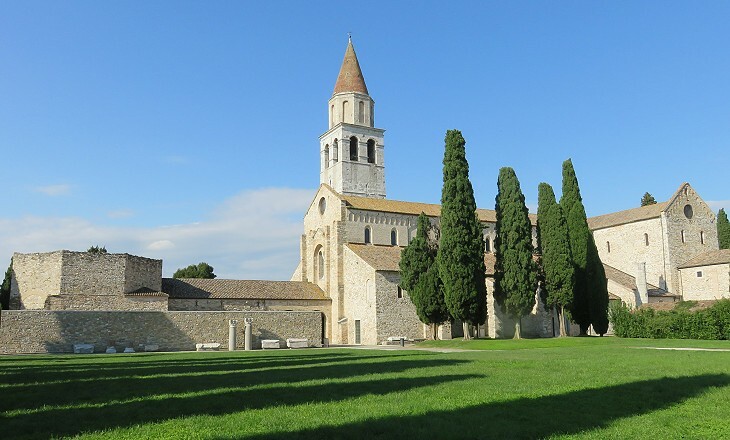 In 606 the Patriarchate of Aquileia split into two as a consequence of the political division of Italy. The Patriarch residing at Grado had authority over the coastal strip of the northern Adriatic Sea (inclusive of the Lagoon of Venice) which was controlled by the Byzantines. The Patriarch residing at Aquileia was the religious head of a large inland territory. Actually he often resided at Cividale del Friuli (former Forum Iuli), a fortified town at the foot of the Alps. In 811 Charlemagne issued a bull which defined the territory subject to the Patriarchs of Aquileia, who soon after decided to return to Aquileia where they began the construction of a large church on the site of halls built in the early IVth century by Bishop Theodore. A door admits to the roofless baptistery, an octagonal building with a small apse in the south-east side next the entrance. This building has undergone so many changes and is now in such a state of decay that it is difficult to restore the original design even in imagination. 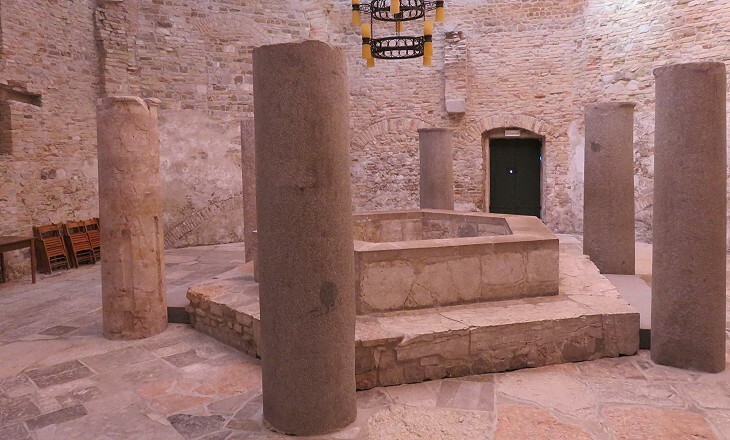 (..) There was a large font in the centre, intended probably for immersion of adult converts, which was surrounded by an arcade of pillars and arches. The arcades were in turn inclosed by the main walls of the baptistery, and united to them by buttress arches spanning the intervening space. But there are now only six columns, and it seems improbable that this incongruous arrangement of a hexagon within an octagon should be original. A major reconstruction of the Baptistery was carried out in 1739. 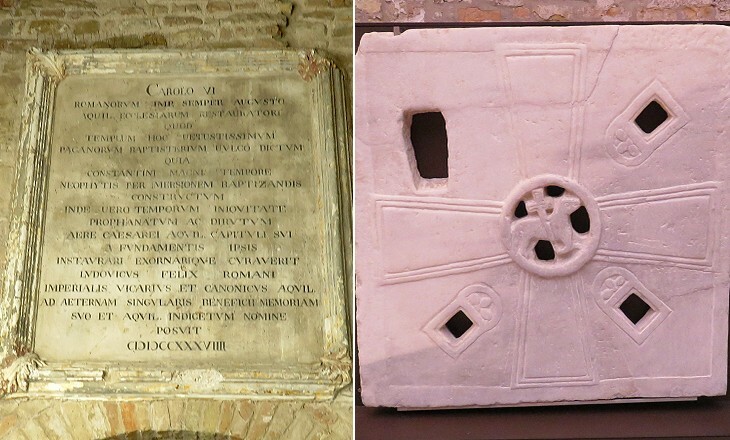 The inscription says that the Baptistery was believed to have been built at the time of Emperor Constantine (IVth century) neophytis per imersionem baptizandis (to baptize catechumens by immersion). 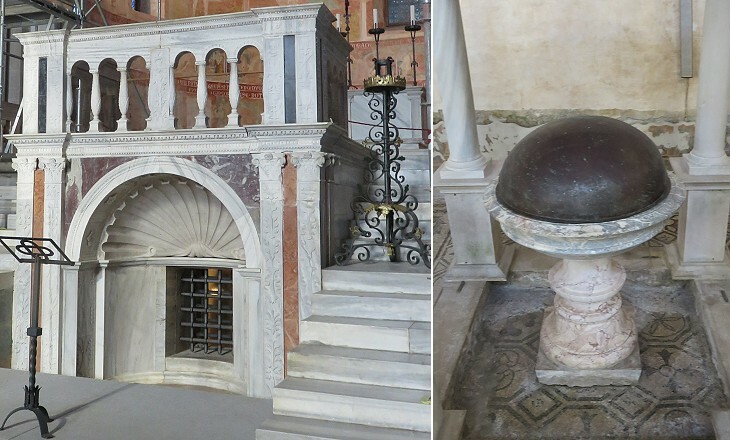 The Baptistery instead was built in the early IXth century when immersion baptism was no longer common in Italy. The error in dating the building might have led to assembling ancient stones and columns to form a hexagonal basin which never was there. The IVth century Bishops of Aquileia were renowned for their theological knowledge, those of the XIth century for the wars they waged to increase their power and enlarge the Patriarchate. Patriarch Poppo (Wolfgang von Treffen, most likely a relative of German Emperor Conrad II) erected the imposing bell tower, which was meant to be the visible sign of his power, next to the Basilica he was in the process of rebuilding. It can be seen as far as Trieste. 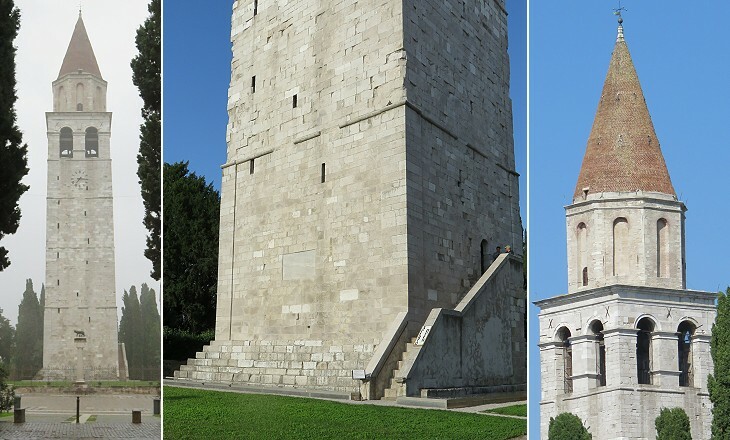 The bell tower satisfied the pride of Patriarch Poppo and provided Aquileia with its current major landmark, but it was built with the stones of the amphitheatre/theatre of the ancient town. In addition it destroyed the mosaics of one of the halls built by Bishop Theodore. To the credit of Poppo one must list a series of reliefs celebrating the Millennium from the Passion of Jesus Christ. Marquard of Randeck was another Patriarch of German origin. He engaged in continuous wars with the Republic of Venice. In particular during the War of Chioggia (1378-81) he attacked the Venetian possessions in Istria and captured Pola, which eventually he was forced to return to Venice. He maintained however Trieste. 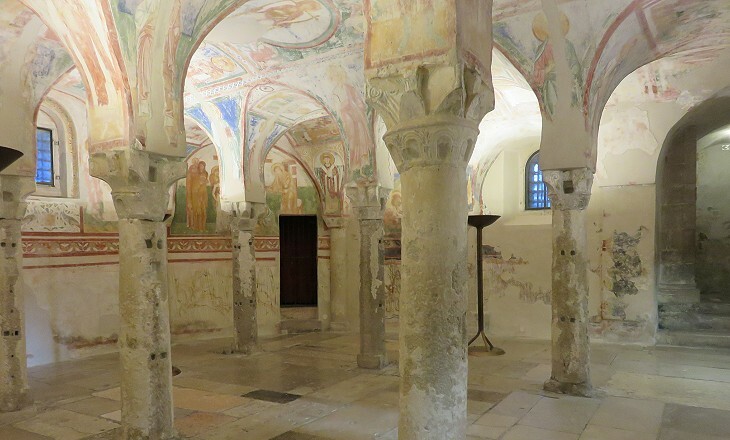 Today the crypt is dated ninth century, although some of its walls are of the Roman period. 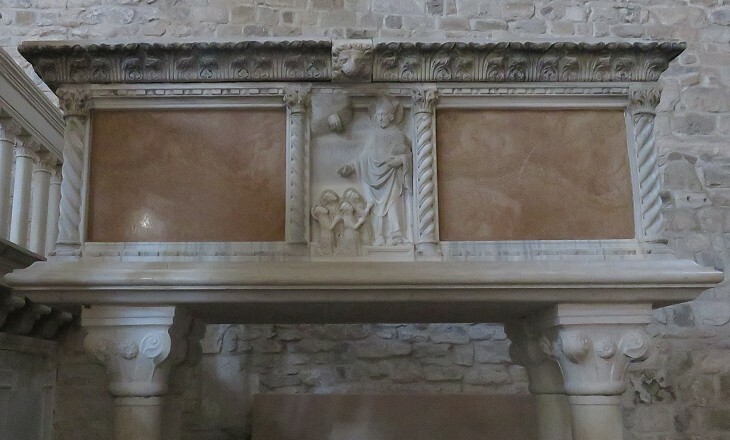 According to tradition it was the prison of the first Christian martyrs at Aquileia. It was eventually used to house the Treasury of the Patriarchate. The frescoes are dated XIIth century, after the reconstruction of the basilica by Patriarch Poppo. They are not without vigour of expression, especially in the group of four women watching the Deposition. 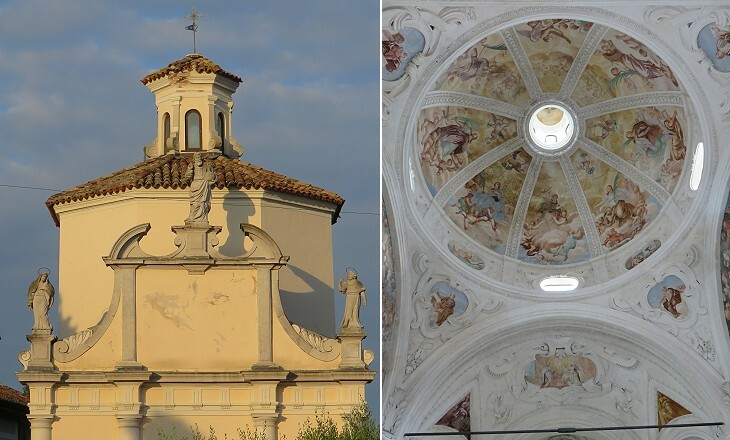 Frescoes were not often used in the region because of dampness. 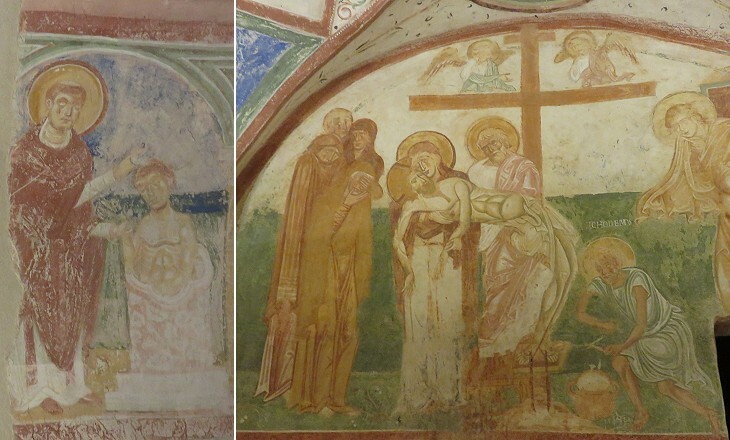 The image used as background for this page shows a fresco from the church of the Benedictine nunnery at Monastero. 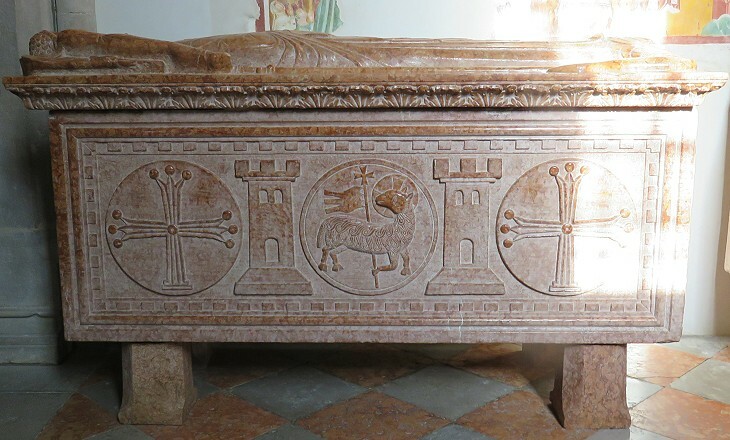 The sarcophagi are without inscriptions. Today that with the Agnus Dei is believed to be that of Raimondo della Torre (and not of Pagano as assumed by Jackson). The Della Torre were a family from Milan and they had been ousted from there by the Visconti in 1312. Ludovico, the last Della Torre Patriarch, had to cope with the growing threat of the Habsburg Dukes (and later on Archdukes) of Austria. In 1452 the Archduke of Austria became Holy Roman Emperor Frederick III. Eventually the Patriarchate was unable to withstand the expansionistic policies of the Republic of Venice and of the Habsburgs. It lost Udine and Cividale, towns where the Patriarchs had resided for long periods, to Venice and eventually the temporal sovereignty over Aquileia itself was ceded to the Habsburgs. In 1751 Pope Benedict XIV agreed to the joint request of the Republic of Venice and of Empress Maria Theresa of Austria to put an end to the Patriarchate of Aquileia. Its remaining territory was split between the dioceses of Udine (Venetian) and Gorizia (Austrian). 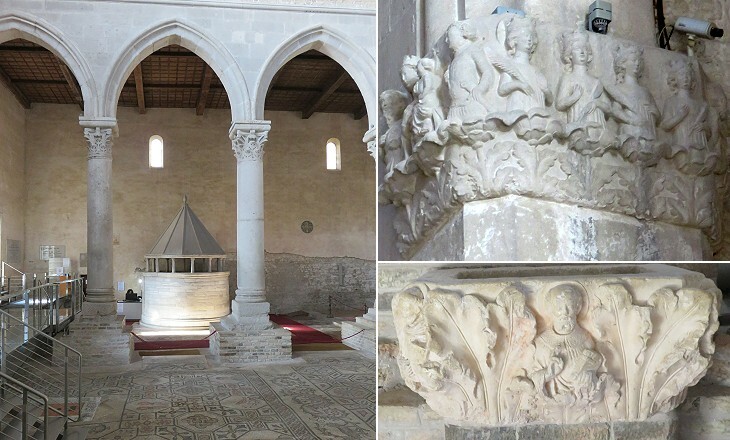 A few years earlier Giandomenico Bertoli published Le Antichità d'Aquileja profane e sacre, the first detailed account of the Basilica and of the Roman relics of Aquileia. According to this book Federico Picossio was a supporter of the Della Torre. The wing-spanned eagle of his coat of arms was perhaps that of the Patriarchate. 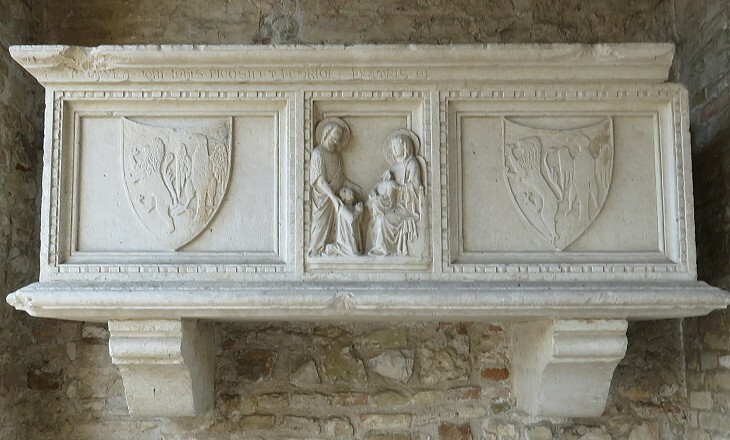 The podium is attributed to Bernardino da Bissone, a sculptor who was active in Venice and other nearby locations between 1490 and 1521. The Basilica was too large for the small population still living at Aquileia and a small church was built in ca 1695 in typical Baroque style. It is situated in what had become the centre of a small hamlet on one side of the River Natisone. 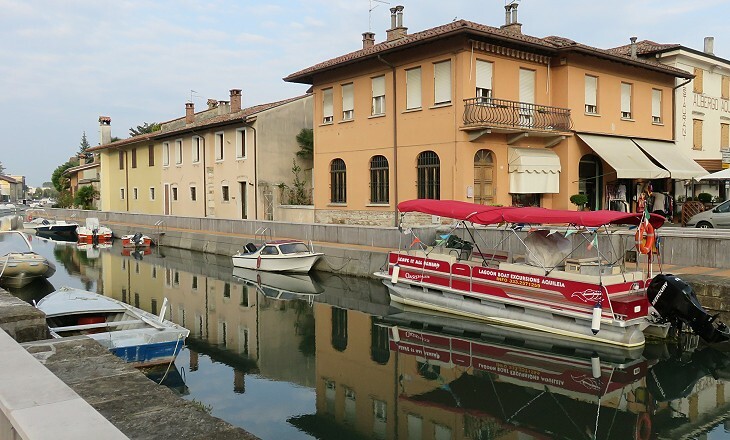 It was navigable by small boats and the inhabitants of the hamlet could go fishing into the lagoon of Grado. When Jackson visited Aquileia he found only a very few houses near the Basilica. 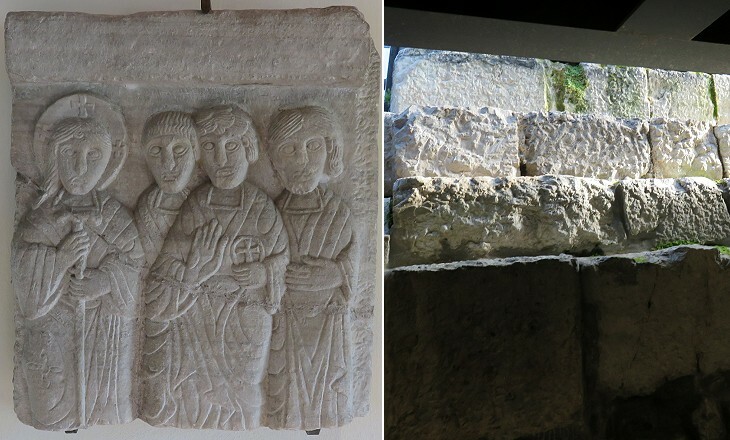 Overall things have not changed much: a couple of small hotels, a coffee-shop, two or three restaurants is all the business linked to the monuments of Aquileia. Nearly all of the visitors come on a day trip from the seaside resorts of Grado, Lignano and Bibione. When they were gone, Aquileia reminded me of Aizani in Turkey or Thugga in Tunisia with their ancient monuments in a sleepy rural context.